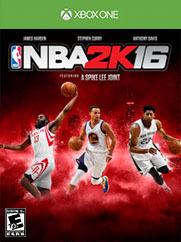 Game Description: The NBA 2K franchise is back with the most true-to-life NBA experience to date with NBA 2K16. Featuring an all-new MyCAREER experience written, directed and produced by acclaimed filmmaker Spike Lee. Guide your MyPLAYER through the complete NBA journey, take control of an entire NBA franchise, or hone your skills online competing against gamers from around the world. With animations that provide smoother movement and more realistic articulation, and a unique cover design featuring NBA stars Stephen Curry, Anthony Davis and James Harden, itâs certain to be the most authentic NBA gaming experience yet.